Give your tile floor a finished look by raising low drain screens with the Extendo-Drain Drain Extension Kit. Each Extend-O-Drain Kit includes a 1/4" thick plastic drain height extension piece, three rubber washers and screws. 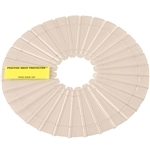 Positive Weep Hole Protector is a patented clear plastic ring is designed to keep mortar from the weep holes in a drain. The ridges of the Positive Weep Protector allow for water to flow underneath the mortar and into weep holes. The Pro Series utilizes an extremely durable, high impact-resistant, engineering-grade polycarbonate base structure wrapped in stainless steel.